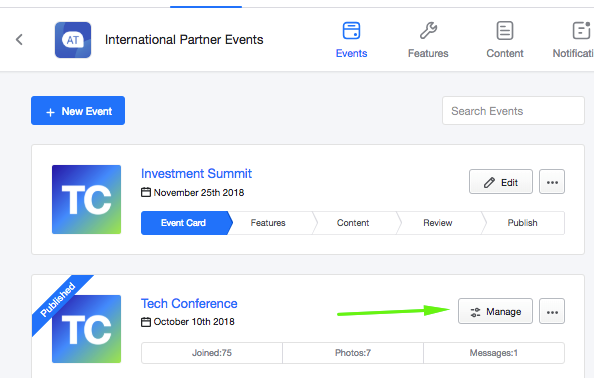 Step 1: Upload the list of attendees to the container and add them to the event you want to create the personalized schedule for. Here is how to do this. Step 2: After creating the profiles, go to the Events step and select 'Manage' for the desired event app. Step 3: Select the Content step and go to the Schedule feature. Change the Schedule Type to Personalized in the settings and click Save. Select the Personalize button to export the attendee grid. 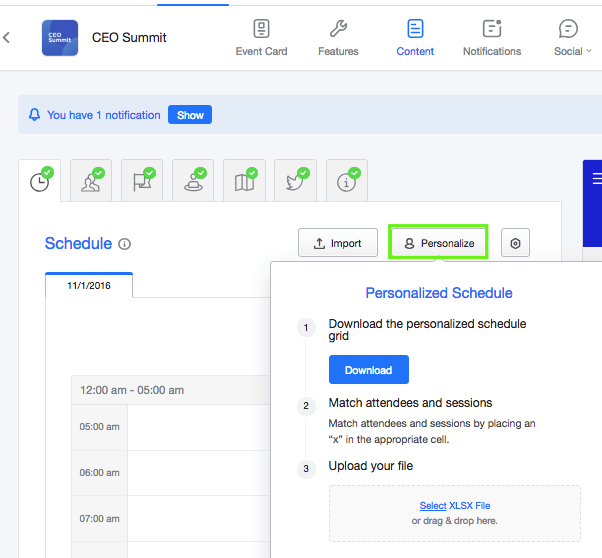 Step 5: Then lastly, upload the grid and as your users join the event it will match up the schedules to their profiles to give them their personalized schedule. Mark all cells with an “x” for attendees that should see the entire agenda. 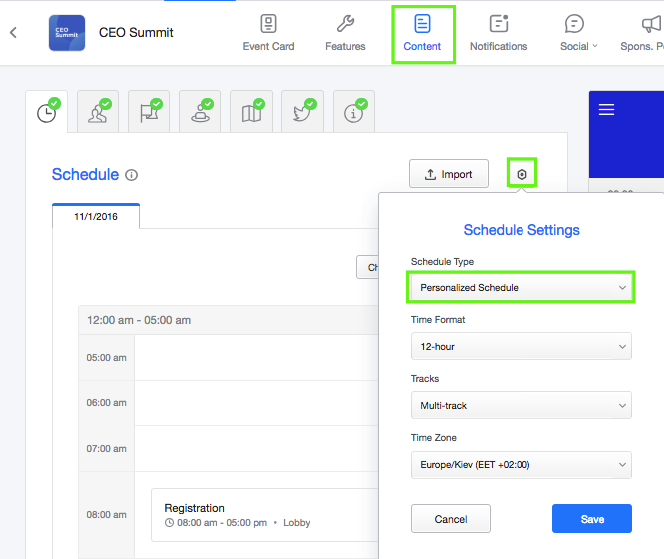 In the case you leave all cells empty, the Schedule feature won't be visible for an attendee at all. Make sure to download the latest grid template anytime you want to make changes, and import it back once completed. Make sure NOT to delete the email column or any of the sessions, this will invalidate the template. If you need to remove an attendee, please do so in the "People" section of your app's management dashboard. 1. Go to the Social > Profiles section of your event's dashboard and click on the profile you want to add sessions to. 2. 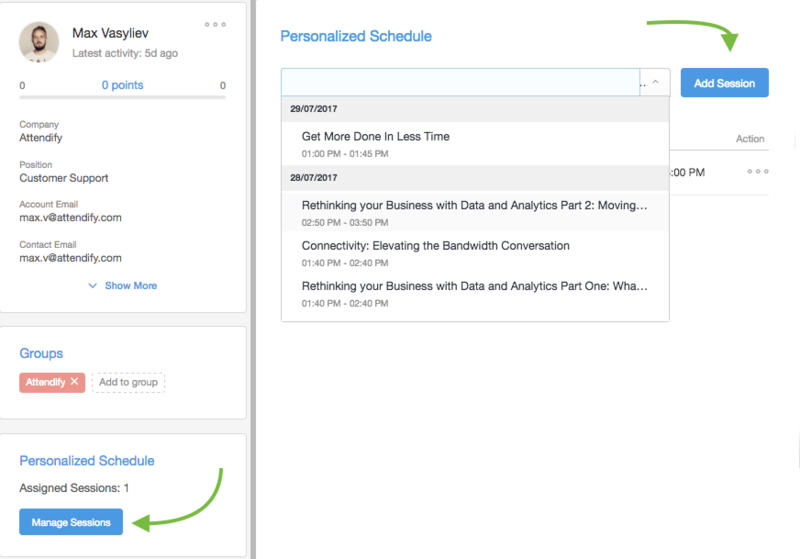 At the bottom of the profile details you will see the Personalized Schedule section where you can add sessions.